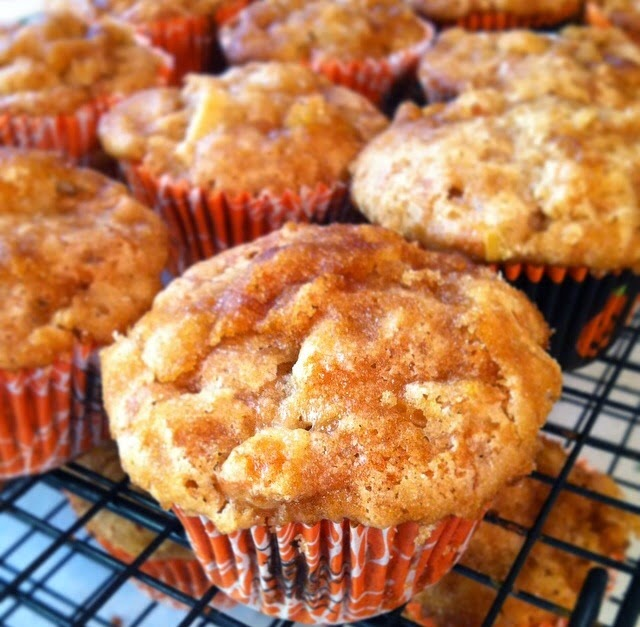 In a Nutshell...: Awesomely for Autumn: Apple Cinnamon Muffins! As some of you might be aware - it's Fall here in New England! Gasp! Well, if you didn't know you sure do now. It's been 70 degrees and under for the past 3-4 weeks now. I think it's finally safe to say that summer has left the building! YES! I am definitely not a summer gal. I am more content in chillier climates with some sun, some clouds, some wind, and a lot less sweating. I will miss dress weather. I have loved waking up and just choosing which dress to throw on. I mean, how could it get easier than that? Oh well! I suppose I will have to break out the wool thigh-highs, tights, and leggings to make it work. I will accept your challenge, New England Winter! I hear we have a doozy ahead of us. But before we get too far ahead of ourselves, let's focus on the Fall. There are a lot of things folks love the fall here but some of the biggest are apple picking, pumpkin carving, boots, scarves, and, oh yeah, how can I forget those pumpkin lattes at Starbucks? I do not drink coffee so I have never experienced it but from what I hear it's "life." Oooookkkaaaayyy. Anyway, last weekend my best friend Kaylyn (who I call Red and will probably call Red within this blog many times so get used to it!) succumbed to the Fall activity that is apple picking. We decided to find a new spot as a lot of the Massachusetts orchards are becoming quite the zoo and we've never been fond of crowds. A co-worker recommended a smaller orchard called Carver Hill Orchard. It's sandwiched between all the other popular orchards in Stowe, but has yet to get crazy. I love the Stowe area in Fall. It's like Las Vegas's strip, only for apple orchards. No strippers here, though, folks! Just apple cider donuts, which, in my opinion, are way sexier. Carver was adorable. We found parking just fine and got into the orchard without waiting a minute. They conveniently had 2 spots to purchase your apple picking bags - indoors for a credit card and outdoors for cash. Well we had cash! When we approached the stand, we actually asked if it was where you paid. The young kid looked at us like we were from Mars. We were just shocked that there wasn't a line! Carver is also known for it's apple cider donuts (although, these days, who ISN'T here in MA?) but the line crawled around the porch and down the driveway! No thanks! Red and I waited for about 5 minutes when we remembered that Price Chopper makes AMAZING apple cider donuts, they were often buy a half dozen, get another half dozen free, and there would be no line to get them. So we took off and made a pit stop at Price Chopper on the way home. I am not kidding either - go to Price Chopper and get yourself their donuts! The best! Anyway, let's fast forward to the good stuff. The muffin. So I get home from apple picking and am stumped. Sure apple picking is fun and a New England tradition but what do I actually do with ALL these apples I just picked? Red took her share home but my bag was still pretty darn full! I threw together an apple crisp, which my boyfriend, Cody, and his BFFL, Andrew, devoured after they came home from rock climbing. Still, I had so many apples! WTF? Then I remembered an apple muffin recipe I've had for years - probably since I was a little kid. I dug it up, dusted it off, broke out the Halloween muffin lines, and went to town. I added way more apples than called for - partly because I just HAD SO MANY but also because I wanted to ensure that every muffin was packed with apple chunks. Yum! So even though there is a measurement below, you definitely need to eyeball it. I even added more chunks as I got to the bottom of the batter bowl. As I usually do when I bake, I sent two Tupperware full with Cody to work. He works for a small software company (one I used to work for!) and they just love getting treats. I used to bake all the time when I worked there but since my boyfriend conveniently still works there, I get to send them goodies whenever I want through him! They just ate these up and, well, who wouldn't? All they need a Starbuck's pumpkin spice latte! Preheat your oven to 350 F (180 C) and line your muffin trays. I recommend feisty Halloween themed ones! Prepare the apples and set aside. You may want to sprinkle with lemon juice to prevent browning. In a medium bowl, whisk together your eggs, sugar, applesauce, and vanilla. Add cinnamon, baking soda, and salt. Mix to incorporate. Add in your flour, one cup at a time, and stir to combine. 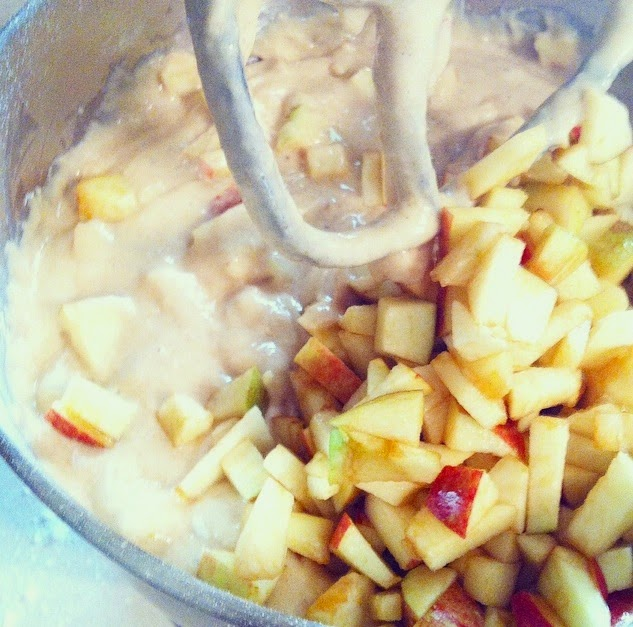 Fold in your chopped apples until well distributed. Fill muffin liners so they're 3/4 full. Sprinkle the brown sugar over each muffin. Bake for 20-24 minutes until a toothpick comes out clean. Serve warm or under a scoop of vanilla ice cream! Then go praise the Fall Gods. I'm so happy you started blogging bc I LOVED reading this- you never realize how funny people are until you read their blogs. I'm a New England gal too (CT visiting my parents for the week, and a new PA resident for the next few years) so this is most definitely my favorite time of year! So yay for all things fall and Haunted Attractions (I'm headed to the Bates Motel this weekend in hopes of getting spooked!!) Can't wait to read your future posts!